Neo Cab isn’t a game that will make you feel optimistic about the future—that is, unless the notion of a cyberpunk SoCal border town oozing in surveillance and run by an insidious conglomerate excites you. That is essentially the world of Los Ojos, the universe designed for the upcoming narrative game that imagines a future roughly 30 years from now when tech has extended its grip beyond San Francisco. In the game, you play Lina Romero, a young Mexican-American woman trying to survive in the city without benefits or job security. Creative lead Patrick Ewing told Gizmodo a reason they chose a woman, specifically a woman of color, as the protagonist was because they are more vulnerable in the gig economy. Lina is a ride-sharing driver, one of the last human ones left in a city built on automation. The gameplay is simple, but the psychological forks in the road are not. As you pick up different passengers, you are given dropdown options for ways in which you can interact with them. The object of the game is to maintain a high rating and make money, but to also take care of your mental health. That often comes at sacrificing one for the other. Your ratings are shown at the end of each ride, while your emotional wellbeing is shown on a futuristic bracelet Lina is wearing, or what Ewing described as a “FitBit for your emotions.” You’ll also pick up on how people are feeling based on subtle nuances in facial expressions during interactions. 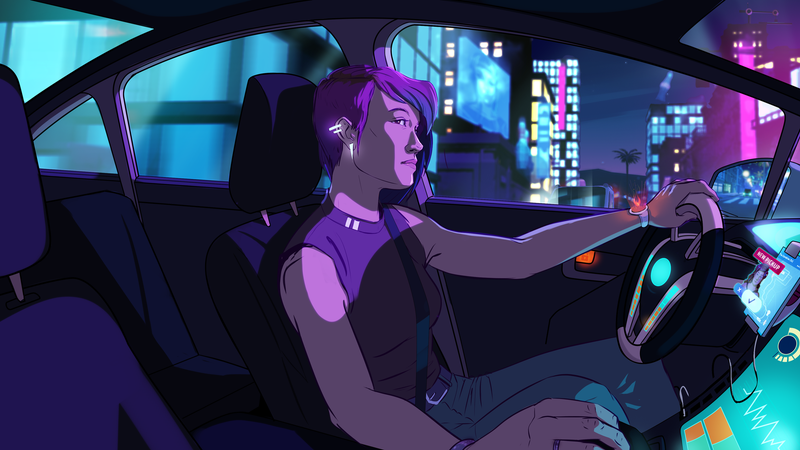 The Neo Cab team said they interviewed gig workers from the likes of Uber, Lyft, Postmates, and Zesty during their research for the game, and while many aspects of the game are certainly fictionalized, a lot of them are rooted in real-life gig economy experiences. It doesn’t feel like a clichéd or dramatized version of the future—if anything, it feels more like a warning sign drenched in neon. Ewing noted that gig workers are already living a pretty gamified life, given their incentivized bonuses and a need to keep a certain amount of stars to ensure their job security. In my short time with the game, which is expected to release soon, I encountered a passenger working for Capra, the game’s fictionalized tech conglomerate that pretty much runs the town and is constantly collecting data about the people in it. I also picked up a drunk douchebag that seemingly puked in the backseat and then gave me a low rating for the puke in my backseat, even though I sacrificed my emotional wellbeing to appease his unwarranted discontent during the ride. You might also come across a passenger that tries to hit on you. Ewing said that in a few of the interviews with women gig economy workers, they noted how some passengers might find them on social media right after the trip. One woman in Oregon said a passenger intentionally left something behind so he could see her again, while a driver in San Francisco said she was invited to a drug-fueled foursome. “We definitely have the fragile male ego character,” Ewing said. The game will also indirectly address themes of DACA and the border fence, Ewing said, given the world is near the California-Mexico border. Ewing alluded to the potential for rides with discriminatory undertones. (“Where are you from. No no, where are you FROM.”) The game will feature themes of power imbalances, gender issues, and “living in this border fence time,” Ewing said. It’s a game about the gig economy, but it’s also a game about self-care, all of which takes place in a world consumed by corporate surveillance—a world not so different than the one that has already arrived.